The commemoration of death and the veneration of ancestors is one of the most recognizably ‘human’ traits, observable in archaeological contexts dating back at least into the Upper Paleolithic period in Europe, and possibly earlier still in the Middle East and in sub-Saharan Africa. The majority of human cultures practice rites and ceremonies of different levels of complexity which mark the transition of a member of the community from the world of the living to the world of the dead, although it is now generally acknowledged that understanding what ‘death’ is and how people who have died relate to those in the world of the still living can be very ‘fluid’ and not necessarily defined in the strictly dualistic way that people in modern ‘western’ societies do. In Spanish speaking countries, ‘All Souls’ Day’ is also called ‘Day of the Dead’ – otherwise Día de los Muertos (as in Mexico) or Día de los Diifuntos – is celebrated on 2nd November. It is an important day for many people across the world in countries and cultures practicing Catholic Christianity, and no less here in the Ecuadorian Andes. The period starts with the feast of All Hallows, now called Halloween on 31st October (and since degenerated into more of a global celebration of all things dark and spooky), All Saints' Day (for the Catholic Saints in Heaven) on 1st November, followed by All Souls' Day on 2nd November, commemorating the souls of baptized Christians who have died and who (in Medieval Catholic beliefs) are still toiling their way through Purgatory. 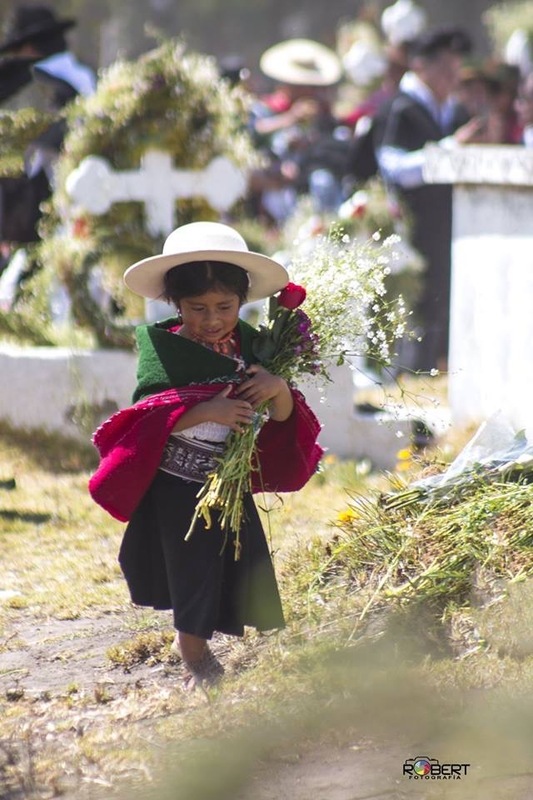 Today it is the day where family members, now dead, are remembered by the whole community with a day-long festival at the cemetery around their graves. Gifts of food and drink are left at the graveside with lavish floral bouquets and decorations everywhere. People dress in their traditional finery and bring copious quantities of food: the ubiquitous cooked guinea pigs, potatoes, maize, beans, specially baked bread rolls, fruits and sweets, served, interestingly, in bowl-like receptacles made from hollowed out gourds. Then there is the alcohol. Crates of beer and bottles of spirits, occasionally chicha (fermented maize beer) are offered around and as the day progresses, many people get very inebriated. It is the one day of the year when it is acceptable for women to drink alcohol too. I had been invited to spend the occasion with the family of Jorge Caisabanda at the graveside of his paternal grandmother and great uncle (her brother). The family is quite extensive, so different branches of it were celebrated by different gravesides, and people would make their way between different groups and spend time at different gravesides of other family member, in-laws, and so on. The atmosphere was universally a celebratory one, although also a time when people could share private feelings and sorrows at the gravesides of different family members, loved and missed. From very young children to very aged people and all ages in between, the entire community of the indigenous township of Salasaka was out in (probably) several thousands, and the whole scene vibrant with life and laughter. Sadly, on this occasion however, the cemetery was soon the claim another incumbent. One of the participants who had, as had so many others, imbibed a lot of alcohol, was later hit by a car after dark and died. 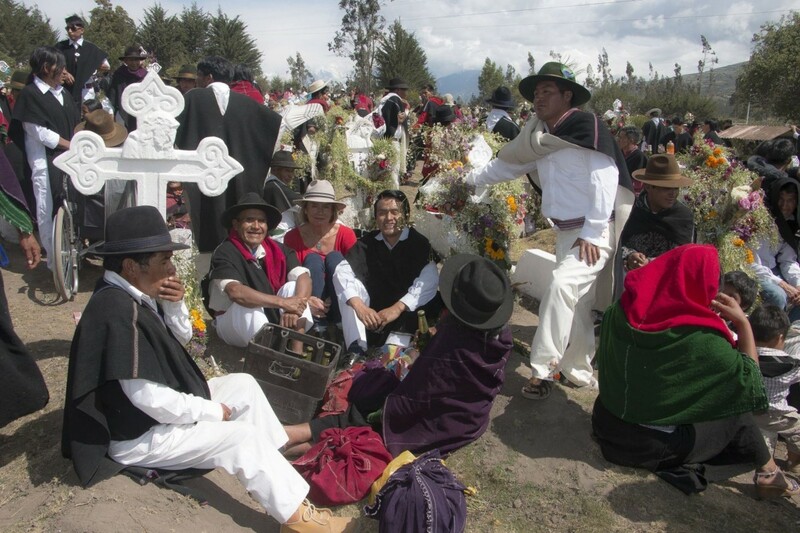 The following day’s fiesta with bands from as far away as Bolivia and Peru, was therefore sadly rather over-shadowed by this event – the continuity of the process of life and death in one traditional indigenous community. In Andean cultures since pre-Columbian times, the veneration of ancestors features very importantly and in the latest pre Spanish culture of the Incas, it was commonplace to keep the mummified remains of dead community members – called mallquis – anywhere from local caves, to specially constructed monuments such as the funerary towers called chullpas. At important times in the calendar, the ancestral mummies would be brought out and paraded publically, offered food and drink and people in this way felt able to connect with their deeper community past, affirming and legitimizing their origins and identity. With the arrival of the Spanish and the imposition of the Catholic religion, interment of the dead body in consecrated ground (for people who had been baptized) became mandatory, and it was prohibited for relatives to remove the remains of their dead relatives, which had until then been a commonplace activity (as seen in archaeological funerary contexts throughout the region). Across time, this eventually became the accepted practice, with the dead generally consigned to cemeteries well away from the realms of the living, although even up until recent years, mummies of dead relatives have been reported as still being kept within the family house (in a domestic setting near Cusco, Peru). 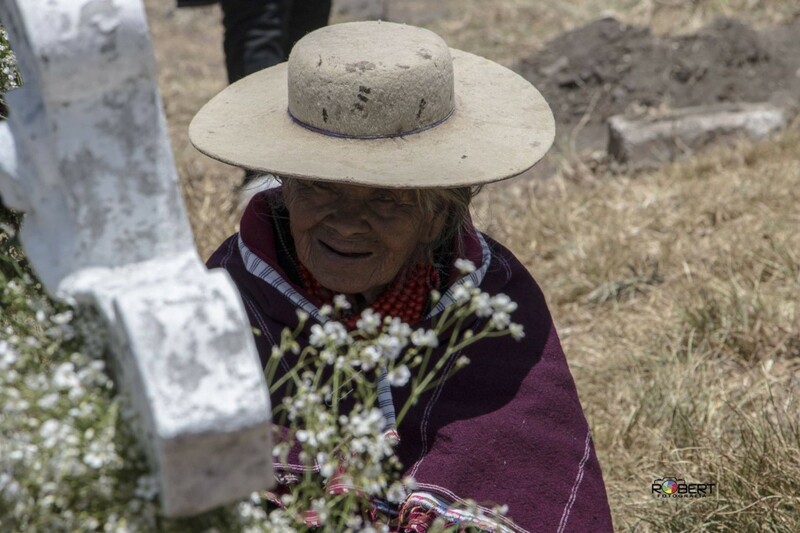 The Día de los Difuntos has, therefore, become the contemporary accepted expression of the age long Andean tradition of veneration of ancestors, with its homogenizing blend of indigenous and Catholic Christian ritual expressions for honouring the dead. Acknowledgments: Grateful thanks to Raymy Rafael Chiliquinga Masaquiza and to Robert W Paredes Martinez for the use of their photographs here. This blog entry was posted on Sunday 12th November 2017.